Most of Photo Slideshow Maker users create Flash slideshows for their own websites. There are two ways to embed PFM-created Flash slideshows to websites, professionally, or get things done easily. Step 1. Open the PFM-created HTML document in a text or HTML editor. Among them, the fs_aux.html provides HTML code for embedding the Flash movie (.swf file) into webpage. Step 2. 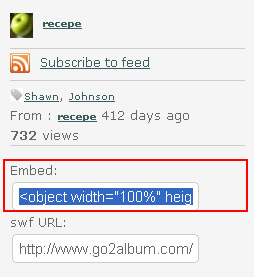 Copy the HTML code included in the <object> and <embed> tags (see example below). This should contain the <OBJECT> and <EMBED> tags. Step 3. Open the existing webpage and paste the <object> and <embed> tags into the desired location in the body of the page. This can also be pasted into a table cell or frame. Step 4. Upload the webpage and Flash files to your Web server. If the webpage and SWF file (and XML document) are put in different folders, you should change the file paths of these two files in the <object> and <embed> tags, or the Flash would "Load Fail". If you don't want to upload slideshow files to Web server, or have difficult in handling the file path, you can simply upload the Flash slideshow to our free web album service Go2Album, and then get the HTML code to embed to your webpage. When you proceed to the last step of creating slideshow with Photo Slideshow Maker, select the "Create Flash File and Upload to Go2Album", and the Flash slideshow will be automatically uploaded to Go2Album. The program will prompt you to the webpage where the Flash slideshow displays. On the right sidebar of the web album page, you will see the embed code. Select and copy the HTML code.